Beautiful Incentives: 10 Dollar Mall now has NYX Makeup!! 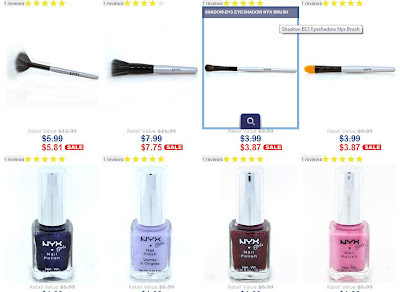 Deeply discounted nail polish, primer, foundation, eyeshadows, brushes, lipsticks...Everything! 10 Dollar Mall now has NYX Makeup!! Deeply discounted nail polish, primer, foundation, eyeshadows, brushes, lipsticks...Everything! One of my absolute favorite stores 10 Dollar Mall, now has NYX makeup and DEEPLY discounted. This is insane and wonderful! Grab it while you can, because I am sure the stock will be very low very soon!! Get $10 for every $10 your friend spends on a purchase, through your link! !You will be credited once their items ship out! Don't wait on this! This is just a very small preview of what they have right now. There are pages upon pages of lips, face, nail and eye makeup and tools! Nail polish is under $2!! Go here to grab your favorites before they're gone!